Toni Murphy was eighteen when she and her boyfriend, Ryan, were wrongly convicted of the murder of her younger sister. Now she is thirty-four and back in her hometown, working every day to forge and adjust to a new life on the outside. She's doing everything in her power to avoid violating her parole and going back to prison. But nothing is making that easy--not Ryan, who is convinced he can figure out the truth; not her mother, who clearly doubts Toni's innocence; and certainly not the group of women who made Toni's life miserable in high school and may have darker secrets than anyone realizes. Before Toni can truly move on, she must risk everything to find out the truth and clear her name. Chevy Stevens is a Canadian author from British Columbia and I think her books just keep getting better and better! If you enjoy that night check out Still Missing, Never Knowing and Always Watching also by Stevens. Frankie Rowley has come home to the small New Hampshire town of Pomeroy and the farmhouse where her family has always summered after working in East Africa for 15 years. On her first night back, a house up the road burns to the ground. Is it an accident, or arson? Over the weeks that follow, as Frankie comes to recognize her father's slow failing and her mother's desperation, another house burns, and then another, always the homes of summer people. Someone is out to get Robin Trainer. After dealing with career problems and divorce, Robin is suddenly a success. As co-anchor of a new TV show, she displays winning chemistry with handsome colleague Carter Brooks, and her new nonfiction book is climbing the charts. Then the sabotage begins: a nasty note left in her purse, book jackets torn through the photo of her face, a dead roach in her coffee cup, a Barbie doll with eyes poked out, makeup that inflames her face, a drugged brownie. Although Robin suspects station superstar Vicky Cruz, an internal investigation revealing private information about Robin's childhood with an abusive stepmother and a recent ill-advised fling with Carter points back to Robin herself. Desperate to clear her name, she accepts help from an unlikely quarter while wondering who, among the handful of people closest to her, she can trust. 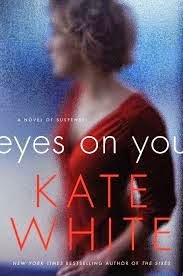 Kate White has also written a few other stand alone thrillers and is the author of the Bailey Weggins books, one my favourite mystery series.